It is very easy to think of bullies as horrible people. We often call people who behave poorly and abuse others “ogres.” This name calling serves to dehumanize our bullies so that we no longer feel compelled to consider them compassionately. After all, why should we feel compassion for someone who isn’t compassionate with us? The reason you want to find compassion for obnoxious and abusive people is because feeling compassion is something you do for you. It will help you emotionally distance yourself from the abuse. Insults don’t sting nearly as much when all you can think is how sad it is that this person feels so horrible that they can’t help but act horrible. This really does work. 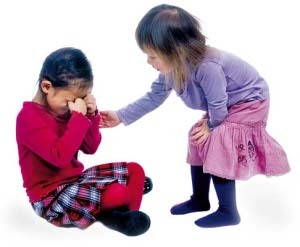 This lesson contains a Reason and Compassion Worksheet as well as a video lesson on compassion. The purpose of this worksheet is to try and figure out the reasons why your bully is bullying and to find ways to make them seem less horrid to you.